Ballistic Racers has another record setting dog! 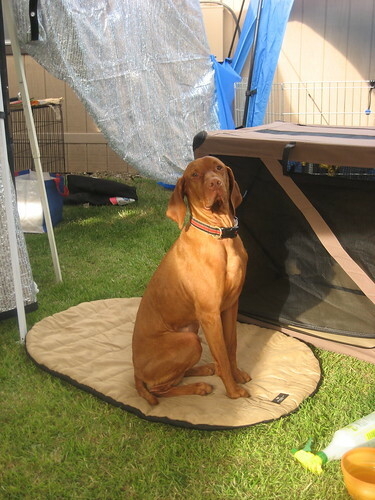 This time it’s “Dennis the Vizsla”, who went Ballistic and is now recognized as the “Breed Ambassador”. For 2009 Dennis had a U-fli record setting run time of 5.446 seconds. Owner Kelly Viscosi received his Breed Ambassador Certificate in the mail today, April 9th 2010, the day of the Woofstock Celebration. This means that Dennis the Vizsla was the fastest Vizsla in U-fli for 2009. What a way to end a day of Woofstock, a festival for dogs and people! 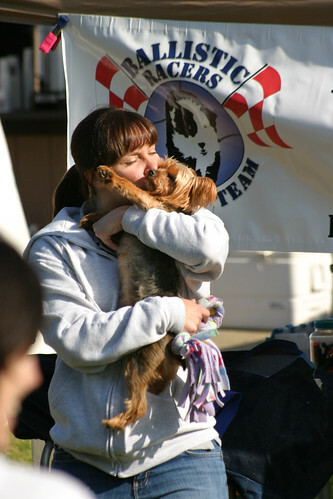 Our other record setting dog was Meika, our team’s little Yorkshire Terrier owned by Jennifer Styers. Meika broke the U-fli Yorkshire Terrier record her first time out! She was racing singles at Ramona in November. Congratulations to Jen and Meika and Kelly and Dennis! Congratulations on an excellent flyball job! You shine!!! Congrats to Dennis, Kelly, Jen & Meika!!! We already knew we were the best – but now it’s confirmed! Go Ballistic! Dennis, your star is shining even more! Meika, you are so little, but your flyball skills do not go unnoticed!!! Congrats to you both and to your moms too!